Think you have what it takes to be a Camp WAVE Intern or Junior Camp Counselor? Are you a story telling, game initiating, page coloring, home sick mending, high-five giving, line leading, note taking, clue charading, world changing educator? If so, we have a seat for you in the spotlight alongside the Camp WAVE staff. Make sure you pack a team-focused work style, a multi-tasking brain, enough energy to spread your passion for the environment to all campers, your Elastigirl level of flexibility, and your wand to spread your version of magic over this amazing camp. The Junior Camp Counselor Program is an educational boot camp for 14 to 17 year old individuals interested in a career in science, teaching, or working with children. 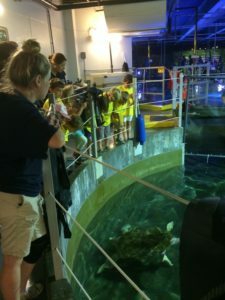 Students will learn about our animals, the aquarium exhibits, local and global conservation efforts, techniques for teaching children as well as behavior modification. During Camp WAVE, junior counselors will assist in storytelling, game initiating, page coloring, home sick mending, high-five giving, line leading, note taking, clue charading, and world changing interpretive moments. For a junior camp counselor, we require a minimum of 24 full days, Mon-Fri, 8:30 am – 4:30 pm, June 3rd – August 9th. There is a strong preference for junior counselors to volunteer for 3 days per week. Jr. Camp Counselors cannot volunteer more than 3 days a week. Teens will be able to schedule themselves on the volunteer database once accepted. WAVE Foundation Summer Camp Intern serves as an instructor for WAVE education programs. Camp Wave Interns provide assistance to the Education Staff during summer camp, provide educational interactive experiences and enhance the summer camp experience. This position requires solid communication and writing skills.